So...sorry for the delay in announcing a winner for my giveaway. My computer is at the lovely Apple store being repaired. By the way, I really don't like being parted from it. Tonight I found out their is a Blogger app for my phone, so I am using it now. I am even having to use an image from my phone. Here's to hoping it works. But let me get on to announcing the winner...Tammy, you are the winner! Please contact me with your info and I will get a CD in the mail to you! Merry Christmas and thanks to everyone for entering! *OK so I can't format the text or the photo with the phone app. Oh well, it isn't really worth complaining about. At least I posted, right? Oh my word, what a cute picture!! Is that your tree or someone else's?? 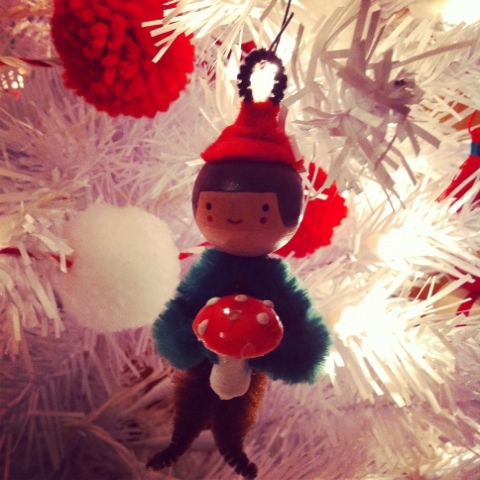 That ornament is so cute!! i hope you have a beautiful week, amy!